Ever wonder how Hawaii keeps an eye on over 4,500 public charities, charitable trusts, and private foundations? Join us on Tuesday, September 18th for an eye-opening talk by the former chief of the Attorney General’s charities oversight program about charitable fraud and malfeasance — beginning with “Broken Trust.” The AG's charities program oversees professional solicitors and fundraising counsel as well, and enforces Hawaii's charitable solicitation law. Our speaker will also provide insights into informed philanthropic decision making. 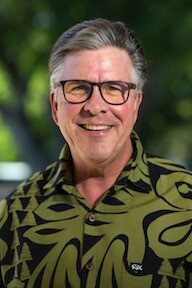 A graduate of the University of Wisconsin Law School, Hugh Jones served with the Hawaiʻi Attorney General’s office for over 28 years and was a Supervising Deputy Attorney of its Tax & Charities Division. He was one of three attorneys that investigated and prosecuted claims for removal and surcharge against the former trustees of the Bishop Estate. He has drafted and successfully enacted four significant legislative initiatives to the State's nonprofit corporation and charitable solicitation laws to strengthen the State's oversight of charities and charitable solicitors. Jones is the past president of the Hawaiʻi State Bar Association, and the 2007 recipient of the Hawaiʻi State Bar Association's President's Award, the 1996 recipient of Common Cause Hawaii's Public Service Award, and a four-time recipient of the Attorney General's Sustained Superior Performance Award. Jones is now In-House Counsel at the UH Foundation. Please come, and bring your guests! Place: The Ohana Room at Architects Hawaii, Ltd, through the courtesy of Harvard Club member David Miller. It's on the 29th floor of the Makai Tower of Pacific Guardian Center, 733 Bishop Street. Lunch: Bring your own sandwich, bento, beverage, etc. The Ohana Room at Architects Hawaii, Ltd.